On November 20 the Orinda Woman’s Club will put on the 28th Annual Festival of Trees Benefit Luncheon and Fashion Show at the San Ramon Marriott Hotel. 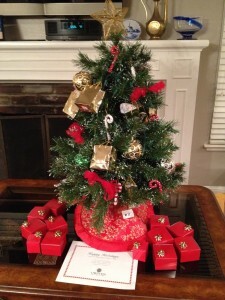 To support the program, the Orinda Juniors have decorated a small tree to be auctioned at the luncheon. Our theme is the 24 Days of Christmas.